This Corona Gorda has consistently increased in quality since its introduction in 1992 as part of the Siglo line. With the Siglo IV, Cohiba have a chance to show off what they do best; big and bold cigars. Perfect construction allows for an excellent draw and a balanced even burn. 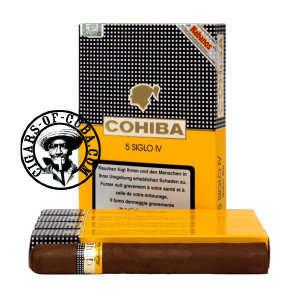 Recognizable Cohiba flavors of honey, vanilla and cedar are spiced up with hints of pepper and nuances of musk. The Cohiba Siglo IV is a feat of balance. This exceptional Puros has surprised us all. There is no doubt that the Siglo IV is classified among the greatest of the Corona Gorda's. Rich and complex aromas. Honey notes combined with a particular mild spiciness and rare aromas of humid Cuban cedar. This cigar is rich and powerful. The bigger ring gauge gives for a solid finish.